Katana is a new light-weight web framework built by Microsoft. It is based on a specification called OWIN – Open Web Interface for .NET. The default MVC5 template in Visual Studio 2013 have elements of Katana and OWIN. Katana allows you to build web based applications, such as MVC or Web API (2) where you can decide which web features to include in the project. Katana features are highly modularised. Instead of including the entire System.Web library even in the smallest web applications, you can decide which features to include and exclude. As mentioned above, Katana builds on OWIN to achieve these goals. OWIN is a specification which defines an an easy and decoupled form of communication between frameworks and servers. With Katana you can build applications that only indirectly use the features in System.Web through OWIN interfaces. Such an application can be hosted on any server that supports OWIN so it is not tightly coupled to IIS. Normally a .NET MVC web application references the entire System.Web namespace which has a very large amount of features of which your application may only need a fraction. Also, it will be tied to IIS. Katana takes an other approach with its portable, modular and lightweight components. I won’t test your patience any longer – let’s see a demo! We’ll build both a Console and a Web application so I have downloaded Visual Studio Express for Web and Desktop. If you have the full version of VS 2013 then you’ll be fine. The Hosting package will also install a number of dependencies such as Owin and Microsoft.Owin. These are the core Katana libraries. 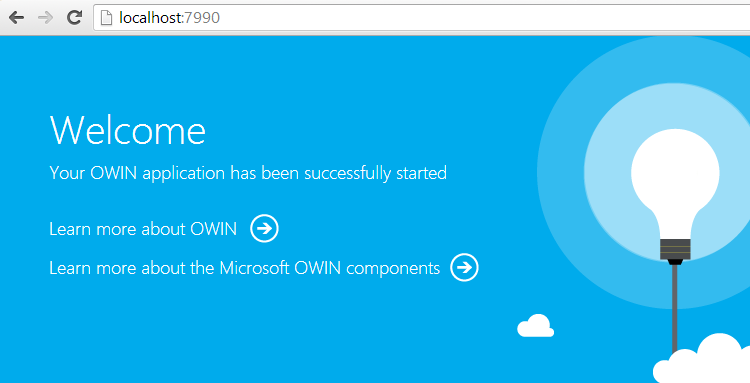 Owin contains the core OWIN abstractions, whereas Microsoft.Owin is the Microsoft extension to OWIN. The HttpListener library includes classes to communicate with the operating system. It also enables us to build a small app that listens to HTTP requests on a port. Which is what we’re planning to build here. IAppBuilder includes methods that help us configure an application, in particular how it will respond to HTTP requests. There are a lot of extension methods to the IAppBuilder interface. They are available in different Owin-related libraries. So as you reference additional Owin packages from NuGet you’ll see new extension methods available for the IAppBuilder interface. This provides you a way to enable new features as they become necessary. The Run() extension method helps us configure how the application will handle HTTP requests. Katana will call into this method to process the requests. It accepts a Func delegate which returns a Task object and accepts an IOwinContext object as parameter. The Environment property returns a type of IDictionary of string and object which is quite generic and is characteristic of OWIN. Normally in ASP.NET we have access to strongly typed classes when we extract information about the incoming HTTP request. Here, however, the information is stored in a generic dictionary of the very basic “string” and “object” objects. OWIN aims to provide a simple API without a lot of specialisation. WriteAsync returns a Task so it is perfectly suitable for our Func delegate. We’ll dig deeper into OWIN and Katana in the next post. This specific default welcome page is hard-coded within the parameterless UseWelcomePage extension. Take a look at the different overloads of this method here to show a custom page. Can you do a tutorial please? I would like to customize the Owin default page. I’m not sure what you mean. What is the issue with localhost? Can you explain what you mean by “not hardcode but listen to port 7990 in the default hostname”? What if my default hostname of the machine I’m running is not localhost? The issue I’m having is I can browse http://localhost:7990 in my machine which is hosting it but not from the networked machined which is otherwise able to access other stuff hosted via IIS? How can i get acces to the hostet page from other devices in same network? Which host adress is necesarry? I guess you’ll need to put the page on a common server that is accessible to the devices in that network and access it through IP:port. simple steps .. nicely done! Katana allows you to build web based applications, such as MVC or Web API (2) where you can decide which web features to include in the project. As in your article mention about it, how can i construct that kind of application? How can construct this in MVC application?